If I had to limit myself to a few of Breen’s LifeShapes, I know what three I would choose: the Learning Circle (processing kairos moments), the Triangle (balanced relationships), and the Semi-Circle (work/rest balance). 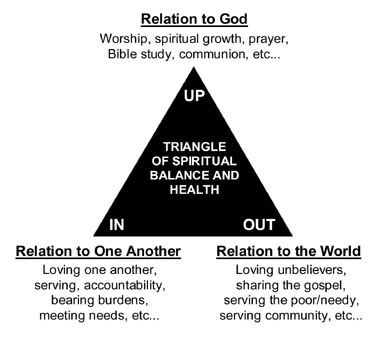 I think these three shapes have such potential for powerful transformation in a Christian’s life. I’ve already explained the Learning Circle, so let me explain the Triangle now. As a minister, this is an exciting LifeShape to watch people implement in their lives. Why? Because they begin to strengthen their relationships with non-Christians in an intentional way, and this usually leaves to evangelism. “Jesus lived out his life in three relationships: Up—with his Father; In—with his chosen followers; Out—with the hurting world around him” (Kindle Locations 980-981). Mike Breen explains these three relationships using Luke 6. UP: Our relationship with God. In Luke 6:12, we see Jesus spending time in prayer. In the midst of so much he could be doing, Jesus takes time to pray to His Father. This shows how strong and how important Jesus considered his relationship to God. 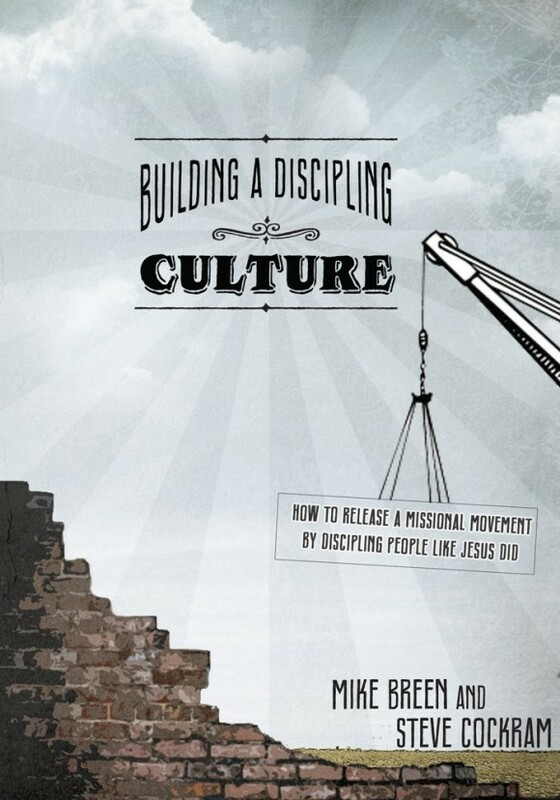 IN: Our relationship with other Christians, especially those we are discipling. In Luke 6:13-16, we see Jesus calling the apostles into a discipling relationship with him. They are going to spend a lot of time with him and be trained by him. OUT: Our relationship with the world, that is, with those outside the Kingdom of God. Jesus obviously did not live blocked off from people who weren’t good, synagogue-attending Jews. He went out into the world and worked to touch people’s lives with the Kingdom of God. We see this in Luke 6:17-19. Breen says, “should. If we do not have all three elements of the Triangle—the Up, the In, and the Out—we are out of balance, and we will wobble through life” (Kindle Locations 1024-1025). We should have strong relationships in all three, though, as Breen comments, many churches are often weak in one of these areas. He calls these “two-dimensional churches” (Kindle Location 1028). “It is more likely, however, that a church reflects the dimensional strengths of its leadership.” (Kindle Location 1030). Breen lists the types of two-dimensional churches that we can have, so I want to describe them. As I said, he focuses on the types of two-dimensional churches, but I think every type of two-dimensional church has a corresponding two-dimensional Christian. Up and In: These churches often focus on having good worship, Bible lessons, and community. According to Breen, they are often innovative in worship and emphasis small groups. But they struggle to translate their Up and In focus into an emphasis on reaching out to those outside the Kingdom of God. Up and Out: These churches often have good Bible studies and stress evangelism. The community is driven more by duty than an actual joy in being a part of the community. They struggle to create a healthy community. In and Out: Breen says that these are the older, mainstream churches. They have lost their focus on the core teachings of Christianity and the importance of connecting with God. They emphasize community within the church and helping the community around them. The Triangle might seem like a basic and simple LifeShape. And here’s why it seems that way: it is simple. But that doesn’t mean that it is not effective. It also doesn’t mean that you can’t use it in a diverse number of powerful ways. I have to admit that my favorite application of it is to guide individual students (remember: I am a campus minister) into more intentional relationships. For most students, this means that they are more intentional about building meaningful relationships with non-Christians. That leads to evangelism. Breen expounds the UP, IN, and OUT relationships more thoroughly throughout the rest of this chapter. His comments are good, but much of what he says is probably already understood by most Christians. If you want to see his comments, then read the book. I don’t think a summary of all that he says will further the usefulness of this detailed review. But I want to draw your attention to three things Breen says: two about the IN relationships and one about the OUT relationships. I’ll just quote Breen on these points and offer minimal or no commentary. First, the IN relationships are vitally important. Why? Of all of Breen’s LifeShapes, so far I have found the Triangle the most helpful. Incidentally, it is also the one that has the strongest Biblical grounding (except, perhaps, the Hexagon, which merely summarizes the Lord’s Prayer). Any ministry or church would be helped by encouraging and discipling their members to have balanced, strong relationships in all three dimensions.